Call me a beauty industry heretic, but when I noticed my first gray hairs I picked up a box of henna hair dye at my local health food store, calculated the hassle factor, and put it back on the shelf. I am not really the type to want to touch up my roots very often, so I was pretty sure I’d end up with two-toned hair before long. Plus, I was concerned that adding dye to my dark hair would make it even darker, which I didn’t want. I wanted to look like ME, with my natural hair color – whatever that turned out to be! Overall, I was actually pretty happy with things. My dad was completely gray by his mid-twenties, so the genetic component of the process was not in my favor. However, I’d had the benefit of real food, and that seems to have made a huge difference. All that to say, I wasn’t looking for a way to change anything when I came across Hairprint, but I was immediately intrigued by it. Hairprint is not a dye – it’s a way of replenishing brown/black hair’s natural pigment while strengthening overall hair structure. Let’s take a closer look at them . . .
Yep, that would be baking soda. Though in my opinion it’s too alkaline for frequent use, it can be helpful for “de-gunking” hair if used appropriately. Sometimes called soda ash because it can be made from burning kelp, seaweed and other vegetation, sodium carbonate can also be created by processing limestone and salt. Also called washing soda. An extract made from velvet beans, which are tropical legumes that have long been used in medicinal preparations. Aka iron, an essential mineral. A fine powder made from fossilized phytoplankton. Here are some ways I was already using it in my beauty routine. Our hair follicles naturally make hydrogen peroxide – it’s an inherent part of creating eumelanin. Since Hairprint mimics that process it’s no surprise to find it in the ingredient list. WHOA, what just happened here? We’re talking about all these naturally occurring minerals, extracts, etc., and now we’ve landed on carbomer. If you’re not familiar with it, carbomer is a thickener made from petrochemicals. So obviously, I had to research it. The Environmental Working Group lists it as a 0, which is the best possible rating, and all the info I could find on it concluded that it is inert. I tried Hairprint for the first time four months ago. The first few days it was a little darker than my normal color, but after a few washes it looked exactly like it had before, only without any grays. Unlike actual dyes, which are not recommended for use with most homemade shampoos, Hairprint works beautifully with my homemade shampooo bar, vinegar rinse and coconut milk leave-in conditioner, and the pigment hasn’t faded at all in the last four months. Blonds and redheads catalyse another pigment with eumelanin to create their natural color. Hairprint is working on a way to mimic this, but right now the product is only for those with brown/black hair. There’s a very extensive FAQ on their site that covers how to transition if your hair is currently colored with coal tar-based dyes or henna, products to avoid for a couple of days prior to use (coconut oil is one because it may block Hairprint), and other considerations. Hi Sharon, I don’t remember what I was researching when I came across this product, but it was totally by chance. No one I know had even heard of it so unfortunately I can only speak from my personal experience. However, if you go to their homepage and click the arrow next to the photo under Before + After, you’ll see actual photos of individuals who have tried it. Several of them started with quite a bit of gray. My hair has gone white in many places. Will this product still work? I have more white than gray. I am using the hairprint (so far I used 4 packages. (2 on April 22nd, 1 one April 29th, 1 on May 20th). My grays (I have over 50%) are kind of like my natural color. My hair is looking stronger and nicer. It is supper hard to use the product. My new growth are still gray and I am hopping if I use it longer there would be no gray. roots are still grey with a hint of very very light brown. It looks horrible. I’ve used it 3 times already. I am feeling like this is not something that is going to work for me. It is not only making my hair jet black; I now have two-toned hair. Roots grey with slight color and jet black hair. I know I am repeating myself but, I am spending so much money to get poor results. I suppose my only alternative is to go completely grey. Hi there. Hairprint doesn’t affect new growth. You will have to continue to do your roots. This did not work for me & I have only a few strands of grey. I was so disappointed. Is there another more natural dye you’ve used? I was so excited when I read this post, and have gotten so much great info from Mommypotamus, that I immediately read up on it and ordered this product. I seemed to be the perfect candidate, dark brown hair, grown-out greys, etc. I am sorry to tell you that this product DID NOT WORK ON MY HAIR AT ALL. I still have grown out greys. Also, the way they package it is extremely wasteful, I could have used a scant 1/3 of the product at a time, and I threw away a ton of unused product because there was no way to just use a portion. Also, the CUSTOMER SERVICE IS TERRIBLE. It has been a week, and despite multiple attempts to contact the company, no one responds. I NEED TO KNOW if it safe to use the organic hair dye I usually use to fix this expensive, time consuming and failed experiment. file this one under SAVE YOUR TIME AND YOUR MONEY AND DON’T BUY THIS PRODUCT. I had to repeat the process to cover my grey roots(normally I colout with a semi permanent dye). I did as instructed and applied some bicarbonate of soda to my toots and s couple of areas around the hairline that needed more colouring. I had a a hairdresser apply it for me to make sure I covered the whole scalp, I reckoned that after paying so much for the product I may as well give it my best shot. It worked!?? It’s been nearly 2 weeks Andy hair looks and feels natural, glossy and not quite as frizzy as before?? After 3 washes it has lightened slightly but it looks like my hair colour. I will probably need to buy/apply another box…so worth doing for the natural result. The only real negative I see is the cost, with postage then tax for it to be sent to Scotland was over £30 but ‘I’m worth it’!?? I have used the product and have other friends using the product. It is EXTREMELY important to READ ALL and follow the directions …including not using hair products for several days to get rid of oily, silcone, etc residues from common shampoos, gels, etc. Fully grey heads needed two applications to cover; by following the directions and adding bicarbonate of soda to the pre-treatment, the pre-treatment opened the hair shaft effectively to receive the hairprint pigment. Some people forget or don’t read the directions stating that THE PRE TREATMENT NEEDS TO STAY ON THE HAIR WITH NO RINSING FOR FIVE MINUTES….I have left it longer. I have split the product contents using a gram scale which I purchased inexpensively from Amazon. The directions to do this are on the Hairprint website. 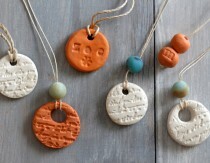 I have found customers service to be helpful and responsive when I have inquired BY EMAIL regarding an order. If you read the instructions, it even says it will take a few treatments to cover the gray completely. Us the product a few time for best coverage. The new growth will never be as covered as existing growth, the more you use it the more it works. Thank you for the tip! If it sounds too good to be true, it usually is. I have been using Aveda to cover my gray, but my hair is now drying out, breaking off and falling out! I am just going to try Henna. I hope it works. Any suggestions on the Henna anyone? yes I have been using henna and indigo for many years to get an auburn color. I love how my hair looks and feels and since I am of Irish decent I had strawberry blond hair most of my life until the gray started taking over. It does take some time to figure your particular color out but honestly I get more comments on my hair and many folks ask if it is my natural color. It is work but I don’t mind doing it. I save lots of money not going to the hairdresser and it is very healthy. I use a 2 part process which is straight henna to cover my gray roots and then I go over my roots again with the henna and indigo mix for the auburn color. I just do my roots each month but the very first time you will need to do your whole head of hair so it all comes out the same color. The site I purchase from is Mehandi.com. They offer lots of helpful info on their website and if you call them they are also very helpful. Hair print does not work ive tried it 7 times an it does not work….absalute rip off!! I have used it and it turned my hair almost black. I am a level 6 and I suspect that it’s because of all of the years of coloring it. I love the concept but I dye my hair red and I’m having a tough time going back to brown anyway. Hair dye is very bad but it’s literally the only thing I use that not chemical free. I am 60 years old and my eyebrows were mostly gray. After 6 months my eyebrows are mostly brunette, the color they have been most of my life and this is not a joke. Also, my hair was an ash blonde and has slowly turned very dark and have put in blonde highlights for years. The last time I put in highlights was June of 2017. I should have about 7″ of very dark roots. However, the hair that has grown back in is more of an ashen color and the highlights I had in the past have been extended into the roots. My nether regions used to be just about completely gray and I can’t find a gray hair as it is completely brunette again. I’ve tried to explain this to my current MD. He never saw me in the past and I he looks at me as though I don’t know what I’m talking about but this is the truth and I can have family members attest to the hair on my head and eyebrows. so what are you doing to make your hair color come back? Which hairprint product did you use on yourself? Dark or brown? My color is right inbetween the two and I’m having a hard time choosing! I am medium brown with some gray are you saying get darker brown then wash out 4/5 times to balance it? Sorry – this is not what I experienced (initially very excited that this product existed but have not had good results in the past 10 months). My hair is currently coal-black from using Hairprint (does not look natural) and I am trying all types of products to lighten it (lemon juice, hot oil treatment – as recommended by the Hairprint rep). I switched from ‘Dark’ to ‘Brown’ and may have to wait many, many months for the black portion to lighten – or I will have to cut-it off (not great). It looks to me like the company is still figuring out their product. The directions say apply the solution to all of your hair – but when I emailed the customer reps they said ‘Only apply’ to the roots. I am probably 60-70% grey and find I have to re-apply every two weeks to the roots otherwise my hair looks pretty terrible. I do not find my hair is healthier or stronger with additional treatments. Only somewhat satisfied with the product – and my guess from what I read is that it is better for people with a little grey (hence the 4 months reapplication) than those of us who are mainly grey. I was so excited to try Hairprint. I am about 60% grey, 40% brown. I used all of their products (shampoos, conditioners, color restorer system) exclusively for 4 months and followed all of the directions carefully. I even reached out to their customer support a few times to clarify directions for resistant grey and transitioning tips. After using the color restorer system five times and being hopeful each time, I can honestly say that Hairprint is not for me. Not only did it make my previously dyed hair super dark (even though I coated it in shea butter each time) but it also didn’t cover my grey very well. I even used the baking soda trick during pretreatment. I find the product very laborious to use (plan on 3 hours with a “step” every 15 minutes), extremely messy (it will stain countertops, skin, etc. if not wiped up immediately), and ineffective on my resistant grey hair. I agree that this is not for everyone and they likely still need to work out some kinks to make the product more efficient and effective. Thanks for this great post! My husband starting going gray in his mid-20s and felt really self-conscious about it. He’s really against dying his hair so I’m thrilled to see Hairprint markets a box for guys too. Ahh, your comment just reminded me of something I learned while researching for this post. The chemicals in conventional dye can damage the hair follicle, which is what infuses the hair with pigment. So when people start trying to cover gray, they may actually accelerate the graying process through all the hair. Henna does not, but I still like Hairprint more because I wanted to stick with my true hair color. I hope you like it! Thank you so much for recommending Hairprint. I am done with all the hair coloring chemicals, and have been looking for a while for something safe and effective. So, you still have grow-out, right? Yes. We don’t know all the reasons that hair turns gray, but one is that the hair follicle produces peroxide. Usually it is broken down by an enzyme called catalase, but if production of catalase is diminished the peroxide sits on the hair and lightens the pigment. Hairprint doesn’t produce catalase. Instead, it mimics the process of creating the pigment that may have been lightened by the peroxide. After reading on the hairprint website, it seems like I would have to use the product everytime I see roots. For me who is 75% gray that would be every 3 weeks. That’s because our hair grows 1/2 inch every month, right? Maybe I’m not understanding the whole concept..
Where can I order hair print from, I live in Australia Perth. I’m in Perth and looking for somewhere to order. Nourished Life in Sydney expect you to ‘Join’ which is often a scam – like ordering products without you knowing; scared of this. Did anyone answer your query??? Suzy Cohen is the only person in the US right now who sells 100% pure catalase. She is a pharmacist who warns about the side effects of drugs. She recently started having the catalase manufactured for her. What does peroxide have to do with it? This is what I have read elsewhere – hair goes grey because as we age our hair produces less melanocytes, which produce pigment – eumelanins (brown and black pigments) and pheomelanins (red and yellow pigments), in varying proportions. Hair grows and falls out in cycles. It is normal for some pigment-producing melanocytes to become damaged and die at the end of the hair cycle. Then the melanocyte stem cell reservoir at the top of the hair follicle can replenish it but when the reservoir of stem cells is exhausted, pigment production stops and the hair turns grey/silver/white. Is this a one-time deal or does it have to be applied every so often? It has to be reapplied every once in awhile. We don’t know all the reasons that hair turns gray, but one is that the hair follicle produces peroxide. Usually it is broken down by an enzyme called catalase, but if production of catalase is diminished the peroxide sits on the hair and lightens the pigment. Hairprint doesn’t produce catalase. Instead, it mimics the process of creating the pigment that may have been lightened by the peroxide. How long does one box/bottle last? One box equals one treatment. How long it lasts depends on how fast your hair grows. I did mine about four months ago and will probably follow up with a second treatment next month. Annnd bookmarked! Thanks for this! I feel the same way about covering my natural brown color. (*So far* I haven’t seen any grays, but I keep looking at the mirror suspiciously to be sure!) I’ve never colored my hair before, but hair color is one thing I’m not sure how willing I am to “age gracefully” with! Can you use this is you have regular color on your hair? I’d love a natural alternative. I colored my hair the same as my natural color just to cover the grey. Do you know when this product will be available in Europe please? I was able to find Morrocco Method on amazon.co.uk if that’s any help. Apologies! Wrong product, but they are also very nice. Hairprint is *not* on amazon.co.uk — have not yet found it in the UK. The company ships England direct. However, I looked into the checkout at Hairprint and they do ship to Europe. If you add your item, then go to the second page of the checkout, there is a drop-down list of all the countries to which they ship. Enter your information here, then go through the checkout until the shipping charges appear. If they are too much, you can just cancel the checkout. The free shipping code isn’t work, I get an “Unable to find a valid discount matching the code entered”. Any tips? Hi Gretchen, are you in the U.S.? The free shipping is for domestic orders only. Let me know and I will follow-up with them! The coupon code is not working for me either. I am in the U.S. Thanks for letting me know! I just emailed them and will follow up as soon as I hear back. Sorry about that! Okay, I heard back! The glitch seems to be happening when two kits are ordered on a subscription basis. With the subscription you automatically get a 15% discount and the system is not able to handle two different discount codes at the same time. Do you supply New Zealand? What’s the cost for everything as It won’t download. Because it has Ferrous gluconate in it aka iron(which many hennas have too) you are forewarned of the following. If you have lightened your hair with peroxide or other chemical lighteners the iron will turn your hair a lovely greenish hue(which is permanent(until your hair grows out). I know this because my hair had been lightened and then slowly the henna that I put on my hair lightened too until what was left was….think Statue of Liberty green . I am now in year 2 of growing my hair back to its original non green state! Hi Annie, just to clarify there is 3% peroxide in Hairprint. It naturally occurs in the hair follicle and is also part of Hairprint’s pigmentation process. The HairPrint site says 1-1.5% peroxide. Why do you keep saying 3% on this site? I’m not sure. Either I was referring to the type of hydrogen peroxide used (3% vs 10%) and not the diluted amount used in an actual application, or perhaps they recently reduced the amount. Either way, the 1.5% is what’s correct so I’ve updated the post. That’s scary! My hair turned black, not green. It must just depend on what’s in the dye you’re using. My hair turned black too, I am incredibly distraught! I used this product, but I find that it takes too long to to apply, too many steps. I need to do it again but just can’t because of the time it takes. I had bought 2 kits. It also did not cover all of my grey’s. What are your thoughts? I used Hairprint for the first time about two weeks ago. I’ve been dyeing my hair with conventional (bad for you) dyes for 25 years which has led my hair to become incredibly damaged and my worry about cancer to increase. I’m not looking for any “why would you use dangerous chemicals” comments here, just letting you know the shape my hair was in when I used Hairprint. Okay so I was nervous to use Hairprint because I was not following their suggestion about transitioning already dyed hair, but it turned out really beautiful! My predominately grey hair was covered and I can go back to using natural shampoos and conditioners! I am so excited. So two important things that I learned from using Hairprint: 1: if you have a lot of grey, it might take two applications to really cover it and 2: if you have bleached your hair or used conventional dyes in the past, be really careful about applying it to the ends because I had to cut off 4 inches after I used it. That’s only because I didn’t follow their instructions. After using Hairprint, I can honestly say that I will never use any other hair color product again. I love Hairprint and I am so thankful that they invented it. Jennifer, I am in a similar situation. I’m 45 and have been 100% grey for years. I’ve been coloring my hair red for over 15 years with a variety of over the counter products, most recently Loreal Feria. It looks amazing and I get tons of compliments but I’ve growing tired of doing it. My hair regrowth is insane, almost 1/2 inch in 3 weeks, so I’m having to do my roots every 3-4 weeks. It’s crazy. Anyway, after reading your post I’m seriously considering trying this. My natural hair color is brown. Not dark dark brown, but more of a medium brown, I guess. Glad to hear this worked for you. Jennifer, I searched the comment database for anything associated with your email and there was nothing awaiting approval. Looks like the internet ate it up somehow – so sorry! Jennifer, just curious, why did you have to cut 4 inches off the hair ends? From what I’ve read that can certainly be the cause in some cases, but I personally would be cautious about supplementing with copper unless baseline levels have been checked and deficiency has been verified. Right now I’m reading a book on detoxing heavy metals written by Dr. Andrew Cutler (chemist, not M.D.) and he says that people with certain genetic mutations cannot properly eliminate excess copper and that can supplementation can lead to toxicity. To my knowledge, copper toxicity (usually due to or in tandem with zinc deficiency) is far more common than copper deficiency, so I would be very sure to have levels checked before supplementing any copper. This is true…a deficiency in minerals is what leads to premature grey. Be careful when supplementing with copper. It can lead to copper toxicity as well as magnesium depletion. Thank you for this information. I’m wondering about brownish red hair. I’m about 5-10% grey and have been using henna. I have found that I need to sleep in it or I’m redoing my hair every couple weeks. There are so many other things I’d rather be doing and I hate the mess! My natural color is a dark reddish brown. Would Hairprint maybe work for me because of the brown I naturally have? If I had a choice I’d rather be brown than dealing with the henna mess. I just did my first henna application about a month ago, and I wish I’d seen this first! I used Morrocco Method, and the color is okay, but it isn’t *my* color. It’s more red/coppery than I would have liked. I got my first gray in high school, like my mom. At 30 I have streaks at my temples and more scattered throughout. My 34 year old brother is more salt than pepper these days. Can this be used for black women with relaxed hair? Nevermind. I see that they have a special kit just for us. Nikki, they have a version for African America women on the website. I’m so happy you did a post on this!!! I found out about this product about 3 weeks ago and was wanting to try it. I really don’t like dying my hair but I like my premature grays even less. I’ll be so excited if I get to keep my brown hair brown and not some auburn red brown shade that the dyes and henna often make it. Question please – I’ve heard that this can be super messy and tricky to apply. Did you have any issues…or destroy your bathroom in the process? Hi there 🙂 This sounds great! Just a couple of quick questions… I have used only baking soda, followed by an apple cider vinegar rinse, then rinsed with water for about three years now. I’m in my late 30s and I do have a bit of a salt and pepper look going in what was medium brown, but it also seems as if the baking soda (and maybe the vinegar) may have lightened my natural hair colour to partly light brown. I’m wondering if I have stripped and dried out my hair with using the baking soda about twice a week for the last few years. Would this be the same effect as peroxide? I’m wondering if the lighter parts of my hair might turn the greenish shade mentioned in their FAQs section. What do you think? And would I be safe to continue the baking soda and ACV after treatment with HairPrint? I would also like an answer to this question. Hi Rebecca, unfortunately I’m not sure on this. You might email them and see what they say. Hi, Heather! I just wanted to say, “THANK YOU” for putting this info out here for us, and, also, for going the extra-mile and getting the shipping for free. I just placed my first order. I have been using henna for a while now, but my family just absolutely hates the smell of it. Great, glorious, continued blessings upon you and yours!!! I have a question about how the hairprint made your hair feel after use. I am 45, but do not have a lot of gray (a sprig here and there). I would say maybe 1 to 2%. However, my dark brown hair has faded in color quite a bit. I will probably be going full gray in a few years. I have been using Morrocco Method Dark brown henna mixed with amla. What I hate about indigo/henna is the mess and time it takes. One application has to sit on my head for four hours, but really should be 6 because it does fade in about a month. What I love about indigo/henna/amla is the way it makes my hair feel. It feels thicker, fuller, and softer. How does the hairprint make your hair look and feel once you have finished with the applications. The first time I applied it I left it on too long and my hair felt a little dry afterwards, probably due to the cleanser that prepares the hair. The second time I applied I rinsed after the recommended amount of time and it was super soft and shiny. Any word yet on why the shipping discount code isn’t working? I’m in the US. Hi Jennifer, I just emailed them about that today. I’m expecting to get an answer today. Oh Heather, Thank you! Excited to try this! Wow! I am very glad to have learned about Hairprint. Thank you Heather! Have been getting more Gray and Dyes nor Henna, were a comfortable choice. I get called my Child’s Grandmother and last Sunday; a cashier automatically gave me a Senior Citizen discount…I don’t want to “Rock the Gray”. I haven’t embraced it well at all….I have a feeling my Gray days will be over and I am so relieved. HHHooray! Thanks again Heather. Hi Tim, I asked Hairprint about this and they said that is a fraction of what you would get in a multi-vitamin. In fact, the quantity is so small that technically they do not have to list it – but of course they do. 🙂 The particular type used is not considered well-absorbed. Hope that helps! Oh bless you for writing this post. I’ve been using henna for a couple of years now but don’t like the reddish colour it brings to my hair. I am going to try this out! The code isn’t working for me. Hopefully the site is fixed before July is up…LOL. Welp, you sold me. Just bought it! MUST COVER THE GRAY!!!!! I can’t handle it anymore! Eeeek!!! I am having more grey hairs in mustache rather than head, this is happened due to haie dye reaction/allergy in melanin. please suggest will this product can be reused oftenly? I am pretty sensitive to smells myself. I can say that I had no problem whatsoever with any smells while using HairPrint. It doesn’t have any strong odours. I’m sensitive to them too. I have some reservations about this product. My hope is that they are unfounded, but I wanted to share them in case anyone had better info on this product that I was able to find. When I first read this I must say I was excited by the idea of restoring my own hair color to my grays, but my “bad science alarms” were going off at the explaination as well as the ingredients. I checked the companies website. I was really hoping to find some serious science there. You know, like how eumelanin was being “activated”. Is there an enzyme it reacts with? Is something inhibiting it that is stripped away? But alas, there was no great scientific report on the website. On top of the missing science the ingredients left me with even more questions. Bicarbonate of soda and sodium carbonate as Heather said are most likely for degunking/washing hair. No big surprises there. So far so good. Mucuna Pruriens is most likely included because it is 3.1-6.1% L-DOPA. The chemical L-DOPA is a precurser to melanin, but needs other amino acids for its synthesis. This ingredient had given me hope there was science behind this product, but I need to see the science. For example a biosynthesis pathway with the source of each amino acid, compound, or chemical would be a great place to start. There have been studies showing that topical application of Mucuna Pruriens to skin can encourage melanin production with UVA exposure, but skin is alive and has accesses to many things hair does not through our body. Datomaceous earth is made of 80-90% silica, the primary building block of hair so I’m guessing it is included for this reason. Again, I’d like to see the science behind the DE bonding with the hair. otherwise I’m inclined to believe that it is either coating the hair or doing nothing. Ferrous gluconate is a black compound that stains. This in itself is not a problem. I would be interested in a mineral based hair dye, but it does call into question the claim of replenishing natural pigment. Are we staining our hair or replenishing it. Manganese gluconate is most likely used in relationship to the ferrous gluconate. Black manganese oxide materials which typically contain iron (ferrous) are black-brown in color and stain things very easily. Staining hair with minerals again is appealing, but is not the claim this product is making. Hydrogen Peroxide is naturally occuring in hair, but it also creates longer lasting hair coloring/staining. Carbomer is used to suspend insoluable solids in a liquid. I can clearly see that this product uses natural ingredients. The few before and after pictures I have seen even look good, but their claims of rebuilding your own natural hair structure/color make me worry. Does anyone have more info on the science, or more before and after pictures? Nice work finding the patent!!! I should have thought of that. I read through the patent. Just for the record, I’ve got a bit of background in chemistry, although if there are any chemical engineers out there I would love to hear their take. I’d love for somebody to prove me wrong on this stuff and give me some better information. From what I’ve gleaned, it seems that this may be a good product (I’m seriously considering trying it myself), but their marketing material is most likely misleading. 1. The patent calls this product a “formulation for dying hair”. This is pretty straight forward. They called it a dye themselves in their own patent. 3 Towards the end of the patent text, there is an example of hair their dye that may or may not be factual and has no supporting science. I would love to know if this is true. If it is true it is remarkable, but based on the paper I linked to above, which uses a very similar process, I am a bit doubtful. I’d love to see some before and after pictures from all of the readers here. What do you guys think? It still sounds like dye to me. Very natural dye that I might very well try, but dye none the less. I read the patent and spoke with the guys at Hairprint. Based on my reading the green chemist was trying to create a dye, but he got frustrated because the hair samples he had were all turning different colors. It was then that he realized that the formula was coloring hair not by dyeing it a predetermined color, but by restoring innate color. Heather I think it is accurate to call this a dye, but what makes it unique is that it is suppose to be targeting gray hairs in appropriate quantities. I would guess that a naturally brown hair analyzed for composition would differ from a hairprint dyed gray turned brown hair. From my understanding (which I’m happy to be corrected on) hairprints color polymerizes and binds more easily on the hairshaft of gray hairs where hairpigment is missing. Because of that the dye takes up more readily (darker) on darker haired people and less readily (or lighter) on lighter brown hair. If you have ever dyed cloth you know that different types of fibers are affected by dye in different ways. In addition I am guessing that this may be the reason many people experience much darker hair at first. The pigment that sits on the brown/black hairs or is over abundantly present on gray hair washes out over the first few washings. Has anyone streaked or spot treated their hair with this product? Spot treating or streaking previously undyed hair would seem like a great gauge as to the accuracy of color restoration. The marketing materials seem a bit overstated, but I think this is really a remarkable product. I don’t know if I’m quite ready to go down the road of coloring my hair, but this would be the product I would most likely try. Both the ingredients and the results seem better than any other product I have looked into. I agree with you. I would like to see documented research about this great sounding hair product too. My first thought when I read the Hairprint website was that, in reality, this product simply dyes the hair. I am personally confident that it’s not a dye, and this is why: No dye can perfectly match everyone’s exact hair color. The best that can be done is to try to buy a dye that is close in shade to your natural color and hope they match up. With this product there are only two formulas – brown and dark brown. They use the same ingredients but one contains more materials to generate eumelanin (which dark hair needs more of to restore color.) A dye covers something in color, while Hairprint restores hair to it’s innate color. Make sense? It has to be a dye of some kind otherwise it wouldn’t stain your hands, towels or clothes. Hmmm, I’ve worked with several materials that stain hands, etc. but interact differently on other surfaces. For example, both turmeric and activated charcoal stain just about everything in sight, but when applied to teeth they do the opposite of staining – they actually whiten. Hair, teeth and nails share a lot of the same building blocks, so it seems plausible to me that hair might resist certain kinds of staining as well. I am very interested in ordering Hairprint. I live in Canada and was wondering if I can order it here? I noticed a number of people in the comments saying that, in fact, their results did NOT match their natural color. Several people above commented that their hair turned black instead of their natural brown. I have to agree with Adelaide – it’s just a dye. The baking soda and washing soda clarify the hair, the peroxide opens the pores, and the legume and the metal salts deposit color. In fact the process is VERY similar to dyeing with indigo, *coincidentally* also a legume, which also requires clarifying beforehand and also deposits color into the cortex of the hair and not on the outside. Personally, I prefer to avoid haircoloring products that use metallic salts, as they can give very unpredictable results and can also result in very weird results if later down the road you want to use other lightening or dyeing products (natural or not.) But that’s just me; there’s nothing really wrong with using those ingredients to dye your hair. What I *don’t* like is their claims that it somehow isn’t a dye. Clearly it is. If it supposedly reactivates melanocytes, how does it work on hair that has already left the follicle? And, as Adelaide pointed out, just what IS the chemical pathway of the ingredients interacting with the hair and producing eumelanin? And why does their patent call it a dye? So it does not use hydrogen peroxide to “dye” hair. Adelaide thanks so much for the inquiry and explanation you provided here. Such a relief to find. I have been searching for several weeks! to find clear information about how/why this is not a dye and how it is actually working. But all I can find are statements that don’t hold up even to my own very limited scientific understanding. The information on the hairprint website doesn’t explain it at all and that made me wary. I am very keen to try this product on my 5-10% greying hair – but I would be significantly more comfortable using it if it professed to be a new, natural style of dye OR clearly stated how it works as a non-dye. So thank you for providing some clear info, it makes me feel more confident to use the product (as a new and very effective style of dye). Hi Heather. I accidentally added my last name to the post above would you mind please removing it before it is posted to the public? Thanks so much! Could you use Hairprint on your eyebrows to cover the gray? I have very black hair and love my salt and pepper locks, but the gray in my eyebrows is a no-no. Please advise! Any thoughts about what we can do to reduce/ revers gray hair nutritionally? Are there specific foods, nutrients, etc that will help? There are several reasons hair can go gray and therefore several approaches to slowing or reversing pigment loss. I haven’t done a ton of research in this area, but maybe I will for a future post. Hi Heather! I was excited to see you write about this– I had heard of Hairprint and was thinking about it, but didn’t know anyone who had tried it. Here’s me big, burning question: When it begins to fade, will your gray hair return to its normal color? I am in the process of *stopping* dyeing my hair because my hair grows SO fast and I literally have to do it every two weeks– and that is just too much for me to keep up with. So now I am growing it out, and it’s kind of agony. It looks pretty bad. I wonder if I were to use hairprint for, say, a year, and then stop, if everything would gradually go back to natural colors– gray hair and all. Does that make sense? Would love to hear any feedback! I just used HAIRPRINT, I stopped coloring my grey, gray, (50% of my head) a year ago… I just applied it tonight. I actually really liked the results. But and I do mean a big but… I should have not put it on my lower 1/2 of my hair… It’s VERY dark. (I have brown hair) I will either chop it off or wait it out. I am happy to post ‘before / after ‘ pics if anyone wants to see… Hope that helps. And some one asked about the smell. Zero smell, to me. Yes, please post your pictures! I just did the hairprint and am waiting for my hair to dry. I had used henna a lot, prior to trying hairprint and found that it had the same effect; leaving the lower half of my brown hair really black. BTW, I took the gloves off while rinsing my hair. Not only did my hands get stained but my white bathtub which is not in the best of conditions…glaze isn’t all there, became stained with black. I had to pour a gallon of bleach over the sides and bottom of the tub after rinsing my hair, and had to wipe the tile (grout stained too) bkz while in the shower rinsing out the hairprint, it splattered a whole lot. Please post pics! I’m doing mine this weekend and am in the same boat except the last time I colored my hair was one month ago. I’m a little nervous about getting the treatment on the dyed part and am hoping the transition steps work so I don’t have streaks or chunks of hair that are really dark. Susie emailed me the pics so I could post them for her. Here they are! The 2 bottom photos both state “3 weeks out”. Since the right bottom photo is lighter than the left bottom photo, should the lighter one state “3 MONTHS out”? Please clarify. Thanks! Hi Heather, I applied this a couple of weeks ago now and love the outcome. However, I’m curious though if you experience any “flaking” of the color? I keep having specks of color under my nails when I wash my hair or scratch my scalp. Hmmm, no I didn’t experience that. Sorry I can’t be more helpful! yes, even after 2 or 3 weeks there is color under my fingernails when washing hair or scratching scalp. but no flaking otherwise. Nancy, I also experienced black flakes. They did finally go away so I blamed it on not getting a good rinse between stages. Not sure though. I will say my scalp now is very flaky so not sure if it is me (I have had issue in the past) or if the product has really dried out my scalp. I am very pleased with the results otherwise. I have dark brown hair which is between the two colors so I went with the 3-5 range. I was pleased with the results but have noticed my bangs have lightened up a bit so not sure if I should try the brown/black. I don’t want to be too dark. Any input would be welcome. Did you use the pre-treatment? I was surprised when I received my Hairprint order and saw the ingredient list on the pre-treatment, because I thought the entire kit only contained the 8 food grade ingredients listed on the Hairprint website. Do you have any thoughts on the pre-treatment ingredients? Do you think the pre-treatment (a “gentle shampoo” to “prepare the hair to receive the Hairprint pigment” and remove chemicals) is necessary for people who don’t use typical shampoos and hair products? do you mind posting the ingredients on the pre-treatment here, please? hey Trish, I posted the ingredients list twice, but I think my comments must’ve been lost. Unfortunately, I didn’t save what I wrote, so I no longer have the list of ingredients (mailed my Hairprint kits back yesterday). All of the ingredients are a 0 or a 1 on the Environmental Working Groups list (the best ratings possible). Hope that helps! My daughter applied on Tuesday and this product is AMAZING! I have dark hair so I ordered the dark. I am 52 and have a fair amount of grey on my roots. I have colored my hair for years but the color has been close to my own natural color so no issues with transition. It came out beautiful and soft and NO SMELL! I am thrilled. Coloring my hair was my last stronghold in living a very clean lifestyle. I have also been dealing with a horrible skin rash on my face and this did not irritate it at all. Again I couldn’t be happier and this product also makes a nice impact on the budget as I will not need to go to the salon to ever color again! On an aside, I happen to ask the company a question and they were very responsive (answering me promptly despite my late at night email), turns out the person was on vacation and was continually checking and answering emails 🙂 so A+ on customer service as well. Starting to have some grow out – just noticed it today but you have to look very close. It doesn’t seem to be as bad as before (can’t explain why) so that is good! It can definitely wait until next week so it will have ended up lasting four full weeks. During those four weeks we were out in the sun and camping and frankly just not treating my hair well and I got more compliments during this last month as it NEVER got that reddish color on the ends or got dry on the ends. Even full coverage with luster and shine! I am so happy I will do their auto shipment from now on! Oh one more comment, except for the pre-treatment that comes with the product I didn’t do anything extra to my grey hair (I stumbled across the tips on how to do that afterwards). Really my hair looks fantastic, just that I have hair that grows fairly rapidly so I wouldn’t expect it to last any long than it has. Is this a one time procedure, or does it need to be reapplied? And community… This article explains the process better than I could ever begin to! I’ve used Hairprint twice and love the results with my mostly grey hair on which I had been using what I thought was a very natural product from Italy! But I learned it wasn’t as great as I thought so turned to Hairprint. My hairdresser came to my house after having watched the video and read all the instructions and we were extremely careful about the pre-treatment and all the other treatments. Now that I’ve had two sessions with her over a 4 week period ($$$$) I’m finding that 10 days or so into it, my roots are starting to show. I am not a happy camper. Any thoughts appreciated. Thanks! My question also, what do you do when in 3 weeks the grey is growing out? Do I have to do this whole process over again on ALL my hair? I read that you do the roots and put oil on all the other hair. You’ve got to be kidding me, right? What a mess that would be! I did Hairprint almost 3 weeks ago. 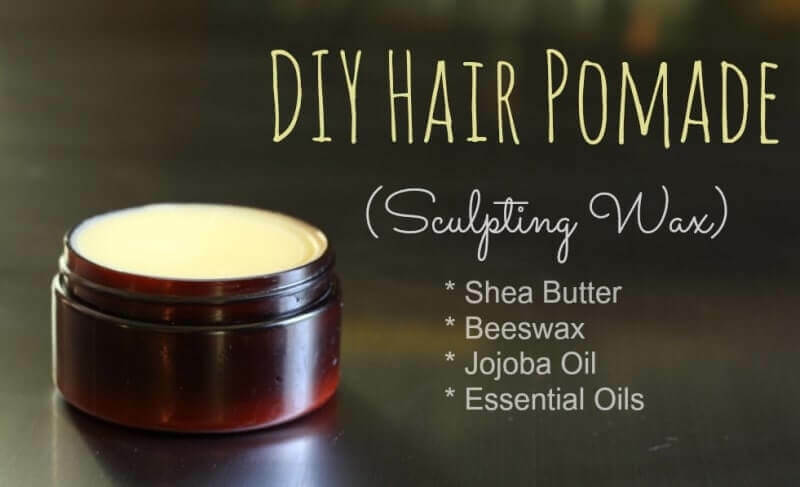 It was very labor intensive and left my hair dry, stiff and brittle. Every time I tried to run a wide toothed comb thru it or ran my fingers through it, I had a handful of broken hair. I usually don’t use shampoo (just rinse my hair with water most of the time) and I never use a conditioner. I had to go out and buy a conditioner and use it twice, leaving it on overnight the second time, to soften and moisturize my hair. Coconut oil did not work to soften or moisturize it. I will not be using HairPrint again. It did cover most of the grey, but not in front of my ears, which is where I really need it. I even scrubbed as directed with baking soda during the shampoo step. I used this product last week and am VERY happy with the results. BUT. First of all, I am 50/50 grey and have been doing slight streaking occasionally, every 3/4 months, but last time I went was 6 months ago so there was not much dye’s left. The BUT is, after using it the smell came out of me for most of this week. I had looked at the ingredients and some related links and saw on this one the mention of carbormer. At first it didn’t bother me, but after using it, it is clear that the ingredients really go in (I don’t use chemicals of any kind, so the odour is very apparent). Until they change this ingredient I will certainly not smear it all over my scalp next time, but will merely slightly comb it though (after applying a bit of oil first to maintain streaking and avoid the root line) when I do root touch ups. By the way, I did find some dubious links, one mentioned to not empty it in drains or waterways, one said …Although carbormer is supposed to be safe the testing is not necessarily accurate, that there is a 97% data gap. Carbormer is a petrochemical and it’s kind of false advertising to say that it is not toxic. I have included the links I found. Apr 18, 2011 – Carbomer poses no safety concerns. The Skin Deep database gives it a zero risk, though does give it a 97% data gap. Thanks for your comment, Grace. I’m so glad you like the results. Personally, I don’t think it’s false advertising to say it’s non-toxic. 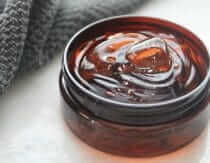 Although I am obviously a huge fan of naturally derived ingredients, there are cases in which I use synthetic materials. One example is food grade silicone. Though it’s gone through a significant amount of process and doesn’t really resemble anything in nature, it’s chemically inert and therefore non-toxic. In my opinion carbomer belongs in the same class. “CarboMer refers to any chemical in which a C2 molecule has been inserted in order to expand the size and property of the chemical compound. Carbomer is the INCI name for Carbopol 934, 934P, 910, and 941. The Green Chemical Handbook includes some bad boys as CarboMers, not carbomer. The Green Chemical Handbook includes many toxic chemicals as CarboMers: Thermoplastic resins like cellulose acetate butyrate and cellulose acetate propionate; there is cellulosic acetate phthalate—an excipient. Carbomer refers to the items covered by the EWG Skin Deep list. It includes the pharmaceutical grade that is approved by the FDA for syrups, dough medicines and other oral medications. It says on the MSDS sheets that these types of carbomers are not toxic and are used in pills and pharmaceutical products. We are applying a tiny faction of an ounce into the formulation, and it is virtually gone in 180 seconds after mixing. As to being explosive, it is, and so is white flour or any grain dust when in suspension. It is the nature of dust. As to odor, it has never had one. That puzzles me. No idea what that is about. We have researched this for five years and applied it ourselves to hundreds of people and never got an odor. I am very curious as what the source or interaction could be. We also have thousands of customers who use Hairprint and no one has reported an odor. I used this product 2 weeks ago and I’m sad to say it did not turn out well. I was one of those that has colored my hair for years, so I had to follow the transition steps. I did this the best that I could but it was very difficult to keep the dye from getting on the color-treated hair. My once-red hair is now black with bits of red and brown mixed in and it did nothing for my gray. I’m now using a natural coffee mixture to see if I can even this mess out. it’s working a bit and seems to be slowly darkening my gray roots. I have colored my hair for years and have to touch up my roots about every 3-4 weeks. I thought this would be a good option as I would prefer to avoid the chemicals, BUT it turned my hair very dark and did not completely cover my roots. I carefully followed the instructions and used the pretreatment as well. It had been about 6 weeks since my last coloring. Worse, my hair feels like straw. I think there could be potential, but the damage incurred with the dryness is unsettling. As I write this, I am sitting with coconut oil on my hair attempting to restore it to it’s original softness. Any suggestions? Has this happened to anyone else? Terri, the exact same thing happened to me. I got the black hair, it didn’t cover the gray roots and my hair felt like straw. It’s been about 1 month for me and the color has relaxed quite a bit. My hair is no longer black, and is now a dark brown which is closer to my natural color. I used to color my hair red, so now I have the aforementioned dark brown with red highlights. It doesn’t look too bad and I’ve actually gotten a few compliments. My gray roots are still there and I haven’t decided what to do about them yet. As far as it feeling like straw, I’ve been using a really good organic shampoo and conditioner, Christina Moss, and don’t use any products at all. It’s finally starting to come back to life and isn’t so stiff. For the moment, this isn’t the product for me until my colored hair grows out. The first time I tried Hairprint, my hair was very brittle afterwards…but I think it was their shampoo. I didn’t use their shampoo the second time, and my hair felt good. I did use a really good conditioner after washing out the Hairprint solution. 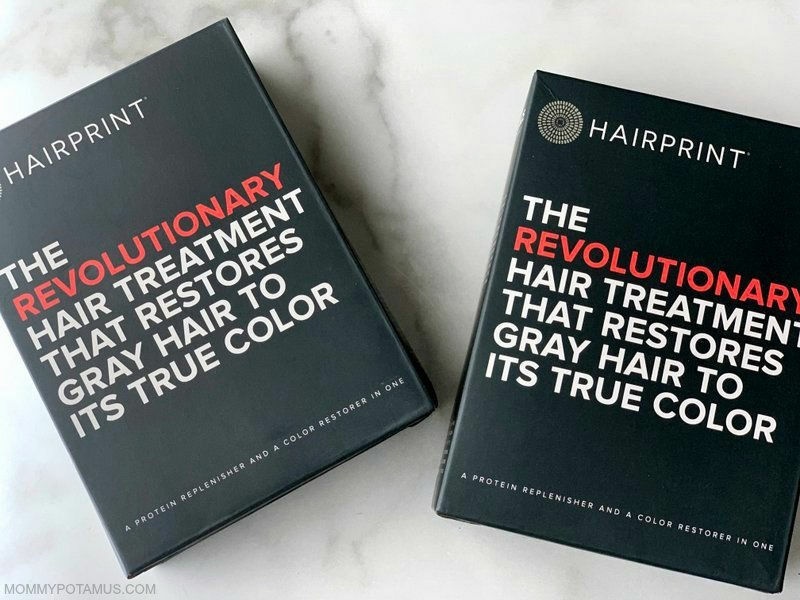 I’ve been reading all the great postings about Hairprint, restoring grey to natural colour, but there hasn’t been anything said about the Hairprint, Anti-aging treatment. I’ve always had very thick asian hair, somewhat course but always very thick. For the past two years I’ve been noticing my hair thinning and breaking. Have any of your readers used the Hairprint – Anti-aging treatment? Has anyone had a problem communicating with Hairprint? I’ve sent several messages over the past 10 days with no response. I spoke with the laboratory that manufactured the product and licensed it to Hairprint and apparently other people are having problems hearing back from them. I’m just trying to switch out the brown for black. Who is the laboratory that manufactures Hairprints and how do I contact them? I got a bad batch (2 boxes with packets that did not mix correctly) and Hairprints customer service is terrible (they claim I must have done something wrong???). Thank you. So after I use HairPrint and it’s been four or more weeks and the grey is coming in, exactly how do I just treat the roots? Is there a way to minimize how much product I need to use without using up (and paying for) a whole package? I think I read one should put coconut oil on all the hair that doesn’t need to be treated. Not my idea of an easy treatment. Any advice out there? I always had prompt replies (one within two days, the second the same day), although the first one was too vague (about how to avoid the root line). The second message I sent them was also prompt and even though it sort of answered my question it was also vague and they didn’t seem concerned about my comments about the body chemistry odour that I smelled on myself after using it (although they did answer my questions about corbormer and I also posted it here). I just checked to see what I wrote in the message I left on this thread three weeks ago and it seems to be gone (although I do get the comment followup – strange). Next time when I do my root touchups I will not smear it on my head like I did the first time but will just comb it lightly through using oil first not touching the pores on my scalp. I am very pleased with the product but for the smell which is still lingering three weeks later. oh … I see, my comment from August 22 is still awaiting moderation. Hi Grace, I may have missed that comment somehow. Will try to check on that after the potami go to bed. I think I also have a rather long comment awaiting moderation. It was in response to one of the comments on my original comment. Hmmm, sometimes actual comments get flagged as spam – I’ll go look for it! I just posted a long comment and now I don’t see it pending approval, so maybe it got lost in cyber space and here I go again (and next time I will copy before sending). I am replying to recent questions about root line, splitting the packages and dryness. I used Hairprint on August 16 and was very pleased with the colour, disappointed about a lingering odour that I attributed to carbormer. I contacted them and received an answer, and as I was about to send in this comment I received an answer from Heather who had sent them my comment and they sent her the same answer … I will post it later if her comment to me is not on this page. First of all I am very pleased with the colour, it is very much as I remember it. I am 50/50 salt and pepper (maybe 60/40 more grey). I have only been lightly streaking every 3/4 months, and before I did the treatment it had been 5/6 months, so I did not have the harsh colour problems, and can see why it could be disappointing for those who have been dying the whole head for many years. I also never use conditioner but did as they instructed ‘to wash and condition as usual’ after the treatment. The following weeks when I washed my hair (I only wash it once a week and don’t use harsh products or swim in chlorine or spend a lot of time in the sun) I didn’t use conditioner. The first week the hair was very dry, but the third week it wasn’t. (I recently found some clean conditioners, Oneka … and Nadine Artemis/Living Libations … also sold at longevitywarehouse). Before I started using it I received instructions about splitting up the packages which gave me confidence to do so. I used one full kit as recommended the first time. But for the root touch ups I will use it differently. I found there was too much product in the bowel the first time, and because of the lingering odour I will no longer smear it on my scalp until the carbormer has been replaced. I don’t know if the odour permeated the toilet paper, or if the smell is coming through the pipes from my septic system … just in case, next time I use it I will use it in a city bathroom. (I seem to be the only person who has complained about this faint smell that has mingled with my body chemistry .. .i can always tell when non-food grade plastic wraps have been used, and can smell the petrochemical odour from wax lined cardboard take out food boxes. At first I had intended to use the Hairprint as a streaking product and contacted Hairprint to ask how to do this becasue I found the instructions quite vague, ‘to rub in some coconut oil, and separate it with foil’ …as in the past my hairdresser only used a cap (and how were we supposed to keep those strands separate??). They wrote back and said to watch the video (which I had) … but then I realized that for the first time it is meant that we do all the hair. I didn’t want a definitive root line after 3/4 weeks so with my fingers I put some oil on a few strands near the roots and in the front where there is more grey … that way I would retain a bit of salt an pepper and maybe not have such a strong root line and could therefore wait longer to do the roots. As for splitting the packages, the instructions said to use a scale that measures grams … I thought it would be a bit confusing to measure to the amounts given, and quickly realized I could just weigh the containers making sure they weighed the same. I saved the packages and plastic bottles for next time (and could even use light weight plastic containers to further divide the kits into quarters or even eighths. Since I only want to do the roots and there is way too much product for that, other than for the first time. Also, since in one of the comments above it says that we don’t absolutely need to use the pretreatment, so if we don’t have any, no great harm done. And because I don’t want it paint it on to my scalp (because of the odour) what I will do when root time comes, is rub some oil through a few strands near the roots and the rest of the hair …. and then lightly comb the product through with a fish comb …maybe while hanging upside down. I’ll post another comment in a few weeks with the results. ps … regarding the colour, it is very much as I remember that my hair was. Heather … just to let you know that many comments could be getting lost. I posted some good long answers to questions about root line, dryness etc etc) and at the time I noted that they were pending approval but now they are gone. I really have to remember to copy and save them as this is not the first time comments have gone to ether space. I also sent the following reply to you four times (just to let you know that this happened) and am now sending it as a general comment so that you get it. Thank you for getting back to me about the carbormer, Hairprint sent me the same answer they sent to you (I do not see your reply/their answer posted here so maybe I will post it later when I rewrite and post my lost comments). I felt a bit better about their explanations about it, but still find it odd that I am the only one who noticed an after smell that permeated my body chemistry and it still lingers 3 weeks later (maybe it permeated the toilet paper and comes back through the septic system, next time I will do the treatment in a city bathroom). I don’t knowingly use chemicals and my diet is fairly clean and organic but surely raw foodies etc would also notice. Hi Grace, do you live in the country by chance? I ask because you mentioned having a septic system, which I know are more common outside of city limits. I live on a homestead with a septic system and satellite internet, and I’ve noticed that sometimes my comments get lost due to a bad connection. Are you having this problem on this site only or others as well? I’d like to pass on as much info to my husband as possible so he can look into it. As for the smell, as I mentioned earlier I have a septic system as well and I have not noticed anything – not even during application. However, after years of formulating body products there is one thing I’m sure of – ingredients react very differently with different body chemistries. In my experience that has been the case with even with the highest quality ingredients, so it’s not necessarily an indicator that something is off. My replies to the comments on my first comment are not appearing either- I have submitted my replies twice. Hi Heather, I will try to reply here but if I don’t see it posted to the page I will leave a general comment. I don’t think it has anything to do with country internet connections because the general comments always seem to post… and yes it has happened a few times on other sites. But I have seen comments on many sites that people’s comments do not go through (which I why we should always copy our comments as it is frustrating to rewrite them… speaking of which as I said, yesterday I left a long comment, it showed as waiting approval, but today I don’t see it). Yes I have a country septic system so thanks for verifying that you don’t smell it either on you or from the system. By the way, I now see my last comment and also that you posted the answer from Hairprint about carbormer. I used the hair print brown product last night. I was very disappointed with the results. I probably am half gray at 42. I had been using conventional color for years, so I tried to cover up the already colored hair with coconut oil as to not get the really dark color on that hair. I think about half of my roots are no longer grey, but that means I still have a lot of grey showing. I followed the instructions very carefully too. Maybe this product would work for someone that is already grey and has not used a color product before. And, a lot of extra hair fell out. My hair felt like straw too, and it took a lot of shampooing it get it to fell half way like normal. Sad that I have to go back to the bad stuff, go back to the hair colorist next week to fix it. And my hair does have a slight green tint to it because of having some blond in my hair. Melanie, I had the same exact problems and frustrations as you. It only covered half of my gray hair. I’m 33 and 50% gray with dark black hair. I also had already colored hair but made sure to have it as close to my original dark color before using hairprint. Afterwards my hair was brittle, impossible to brush through and falling out in clumps. I still can’t brush through it 3 weeks later without using triple the amount of conditioner than before using the product. I have never lost hair like this before. When I wrote the company asking if others had complained about these side effects they said the hair loss was due to lunar cycles in which our hair falls out naturally. I am so disappointed as I wanted this product to work. I don’t want to return to unnatural products either. did this ever get better for you? Joan, I waited 6 weeks and not much improved. I continued to loose hair in clumps. But I wanted to give it one more try. I read other reviews and some said you had to use it twice to truly cover all the gray and get the right hair texture. So I bought another box and had someone else apply it just in case I did something wrong the first time. We did everything right and it still didn’t cover all the gray. The worst part is my hair is falling out even more than the first time i used the product. Over these 3 months I have lost over half my hair. I have bald spots by my temples. I once had thick beautiful soft hair. My hair is now thin and brittle and breaks so easily. I afraid to wash or brush it. If this continues I will have to look into buying a wig. I am so upset over this product. Kristin, I am so sorry to hear about what you are going through. I am not a doctor but what you are describing is so concerning – have you talked with a healthcare provider about the possibility of a severe allergic reaction or other issue, such as thyroid? I used Hair Print last night and was very disappointed with the product. The first packet/mix stung my scalp a lot, the second and third seemed a bit better. It’s very messy and by the end of the treatment I had very dry brittle hair and a sensitised scalp. The worse part is that it left a lot of grey hairs showing and my bathroom sink is now stained. I’m sorry to hear that, Sharon! I’ve never heard of anyone reporting discomfort – do you think it might have been an allergic reaction? Regarding the sense of dryness, that seems to happen on occasion, but from what has been shared with me the hair softens soon after. A second application is sometimes needed to fully restore hair color when used for the first time. Probably not a good idea given your discomfort, but your results are not unexpected. I am sorry to hear about the sink, though. I’ve applied both using my sink and in the shower with no stains – do you mind sharing what type of surface your sink is? I would like to update the post. I know this is a rather late post, but, I also believe that I am allergic to something in their product; and I believe that it is the velvet bean extract. After all people do get allergic contact dermatitis to plants. I am allergic to indigo and after a T.R.U.E. Test found that I am allergic to parthenolides which contain various components found in a lot of different types of plants, pollens, etc. It didn’t burn when I applied the product, but a day or two later my scalp felt slightly burned and I now have dry, itchy, flaky scalp and what feel like sore little bumps that appear and disappear on various areas of my scalp. There is also a small pink, itchy patch near my temple. So I am figuring that Hair Print isn’t quite as pure and safe as they say it is. People can definitely react to it. Were I to continue to use it, I’m sure my symptoms would get worse with each application. Therefore, I decided to quit using it. I am also allergic to chemical hair dyes: PPD and TDS. The link above from Kristen doesn’t work! Hi, just tried this product for the first time and I am very pleased with it. The color looks so natural and seems pretty close to my original color. I was about 30% gray I’d say and what I like best is that my hair color did not come out harsh as it has in the past with conventional dyes. Also, my hair seems shiny and healthy and not especially dried out from the product. No weird odors or any problems whatsoever. I will use this product again. Just wondering… I’m sorry if it said somewhere and I missed it… but did you use the dark, or the brown? I’m doing the “Brown” shade. My former hair dye was a universal 4-5N range. I’ve just been covering the roots because the length of my hair is dark already (from the former dye days), but every time I do HP, the roots don’t seem dark enough to blend with the length of my hair. I worry that if I choose “Dark”, the length of my hair will turn even darker, which I don’t want! But, to get enough color to cover the roots, do you think I may need to go with the “Dark” and try it once to see if it makes a difference? I believe if you only do the roots the rest of your hair will not change in color. I would just try the dark once on only the roots and see what happens. This product Hairprint is really working for me. It is clean, natural (truly natural), does not smell, is 100% non-toxic. I have been using it for 1 year and my coverage gets better and better. I even have my natural highlights shining through. I really cannot recommend it enough. To me it is the only true healthy alternative for coloring hair out there. Thank you for this site and for posting this. Hi – did you find that after this length of use, your hair dried out? I was wondering if you knew of any pregnant women who have used it and if they had safe results with it. I know its fairly new but I am a little over 3 months pregnant with lots of grey and hesitant to try something so new. If other pregnant gals have used it, I would like to know if they had good safe results with it. The answer on their website seems vague though other sites have said its safe to use for pregnancy. I just want some confirmation that other pregnant gals have used it safely. Thank you. I was wondering if anyone with a perm has used this product and what were the results? I have a perm and I have a rinse (semi permanent color)in my hair. Can I use this product and what will I have to do differently? I am considering purchasing this product. However, I am wondering what shampoo, conditioner, and hairspray would be best to use after this product has been applied in order to maintain the effects as long as possible (and to avoid chemical interactions of residue). skin may have broken and then the back of both ears were weeping and then my hair at the back ofy ears kep sticking to my ears and.it was SO SO PAINFUL and difficult to try putting a comb through that. I SUFFERED WITH THIS FOR 5 WEEKS. I WAS TOO SHY YO GO TO THE DOCTOR. I FELT VAIN. Eventually I FELT COMPELLED TO GO I WAS IN AGONU AND COULD NO LONGER STAND IT. Mu doctor gave me some cre and some tablets they may have been antibiotics……in a few weeks I recovered. IT WAS NEARLY TIME TO DO MY ROOTS AGAIN AND I WAS FRIGHTENED. I went to Holland and Barrett and I bought what was supposed to be less harsh NATURTINT. I started using Naturtint myself and just tolerated the reaction afterwards but it was never so bad as with hair dyes from Boots. Last time I applied it with my fingers rather than the nozzle and just rubbed it all over my scalp instead of making partings. AGAIN I GOT A BAD REACTION EVEN FROM NATURTINT. Had to go to Docors yet again. Then went back to same salon and said I NEED THEIR HELP BECAUSED I CAN’T BE DEALING WITH ALK THIS PAIN AND I DON’T WANT TO GO GREY YET. They used Pure Henna again. No reaction but not happy because my parting shows the red roots and when I wear my hair up as I like to, the roots are even more obvious. If I have to pay £50 my husband says he will because doesn’t want me to suffer. 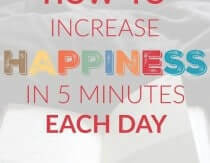 If I PAY £50 I WANT TO FEEL HAPPY BUT I DON’T. THE ONLY DIFFERENCE IS YES I DIDN’T EXPERIENCE AFTER REACTION AND PAIN BUT INSTEAD OF GREY ROOTS I NOW HAVE RED ROOTS. I DON’T WANT ROITS TO SHOW AT ALL. JENNIFER I WANT AND NEED HELP TO NOT GO GREY YET AND NOT GET REACTIONS. PLEASE CAN. Y O U HELP ME AND PERHAPS RECOMMEND A SALON. I LIVE IN OLDHAM. I AM DESPERATE AND VERY UNHAPPY ABOUT MY HAIR. My hair is treated with dye. I intend to change to Hairpront but the FAQs say when using product only use on roots and coat previously dyed hair with shea butter or coco butter. Do you know a good brand to use? I have medium to light brown hair naturally (with gray roots). I had been colouring my hair blond for over 40 years &ado not remember what my natural hair colour was . I was a blond baby but I know that it darkened over time . Now I have grown my hair out to completely grey . I would love to use hair print but wonder what colour I would end up with . My eyebrows are an ash brown . What would you suggest . My friend used the one for Caucasian and did not do anything to her gray hair. I want to try and my original hair color before I go gray was very dark brown close to black and I want to know if I should buy the one for African. How often I must apply to get the best result and get rid of my gray hair for ever. I have tried this and it colored beautifully. One needs to remember just because it is natural, does not mean it is ideal for everyone. Please realize if you use this on your hair, you cannot ever use store purchased hair color on the hair that has been colored with hairprint. After one coloring there was a green color near my roots. My hairdresser said it was from the minerals/salts in hairprint. Henna can be used over hairprint, but not store dyes. If you don’t wont to use store dyes this will not be a problem. We just need to be informed of what we are agreeing to by using this product. Thank you. I’d never heard of this before and have been hating my going-greyer hair for a while now, lol. I’m 46 and absolutely refuse to dye my hair. I figured I was just going to deal with going completely grey but now maybe I’ll look into Hairprint! I’m so glad I Google ‘homemade lotion’ and decided to snoop around on your site, thanks so much! Did this product dry your hair out over time? Hi Heather, just wanted to chime in here. I used to chemically dye my hair also. Within 4-6 after coloring, the color totally faded out and was bright blonde! Not the color I was going for and after so many colorings my hair was fried. I grew out my hair for 6 months and used Hairprint back in February for the first time. It is now May 18 and it’s still brown. Yes, it’s faded considerably but it’s still brown not blonde! They recommend doing two colorings on first time treatments and I only did one. Still, very happy with the outcome. I’m just about to do my second treatment and I figure I’ll do it four times a year. That’s about how long I can stand to go with the new growth of gray. Last year in November/December they ran a special 50%, 25%, or off bogo, I don’t remember but it was a good deal. Hoping to buy all four kits this winter and be ready for a year’s worth of coloring. You will not be disappointed with this product. Also, there is new coloring recommendations that I just received via email. I did not see the new instructions on their web site yet. First, I am an African American with relaxed (25%) grey hair (framing my face) that has been previously colored with black dye. I am wondered if anyone has used Hairprint on relaxed hair? I have my dark hairprint in hand, but have not used it, pending a review on black hair. Now, I am very concern after reading Linda’s comments, you can never use another dye over hairprint. Can anyone or Linda share as to why? If hairprint doesn’t work for me I will continue color by hair. Also, Heather, Thank You! This is great information for those if us who have just found Hairprint! I would really lOVE to hear more Adelaide! I’m starting to have hair grays, I’m not fan of chemical hair dyes as I used them like 10 years ago when I was younger and just wanted to have new looks, but they used to damage and dry my hair a lot, so I decided I wouldn’t dye my hair anymore. Now I’m not that young and gray hair have been popping on my head, so I was looking for a non chemical hair dye. Looking for options, I found this product, and started reading reviews, but some of them seemed to be like paid advertisers, until I found your blog, that seems well intended… I think I might try this product. I am so sorry you did not achieve the results you were looking for. We do have our refund policy on the Hairprint® website and I am including the link for you below. After following the exact directions on the application and have none coverage of my grey hair I received this reply from Hairprint. It’s totally a scam. Terrible mess: the application, labor intense, stains everywhere. Don’t waste you money in this product. I have to agree with those that think this product is either all hype or worse (scam?). It is incredibly messy to use, didn’t color my gray hair at all, yet permanently stained my white sink. Why is it so expensive? Add shipping to the UK of $20 and it is just overpriced as there are no guarantees with hair dyes. Hi My hair is mostly silver if I use this will it turn my hair chestnut brown again? That would be to dark for my age. But I feel old with it silver. Help! Hi Betty-Ellem, If you read through the comments what is obvious is that everyone seems to have a completely different experience. I would not trust that the product will make your hair chestnut brown, that was the original color of my hair, instead it made mine a very dark, cool brown. I have never had this color hair in my life and detest it. What is the free shipping code? I just tried Hairprint for the first time. It didn’t fully cover the grey in my temples but stained it a little. I have a few scattered greys through out but I love the overall color. Probably should have use 2 kits but I have short hair and thought 1 would work. Due to cost I only used 1 kit. I absolutely love this product! I have used it 8 times so far. I use it when my roots become noticeable. I am 45. At first it might seem like a challenge because it’s different than what you’re used to but trust yourself and just do the best you can. It has gotten easier and easier. My hair is looking so beautiful. It feels so special and such a gift to have my natural color back with all its red highlights. I had forgotten what my natural color was. My hair is softer, bouncier and so super shiny. (like I put a gloss on) I did the transition method. Since I had dyed hair, I put shea butter on the dyed ends and focused the product on the roots. My hair is about 1/2 way done. I can really tell the difference between the new hair and the dyed ends. The ends are dry and brittle feeling (and looking) and the new hair is gorgeous. So excited to have my entire head of hair without any dye! Feeling fantastic! I like everything that U have written about this way to keep your hair looking again Great! ( DNA, RNA )or chromosomes / or will any genotoxicity result thereby in dangering my child’s health before or after birth ?? I do understand that this is a very difficult question but Please base your answer on me being a very fit male even though I do have type 2 – diabetes, and have previously done genetic tests, I am okay. Good post, you touched on liking Morocco method henna and that’s the only hair color product I have used and liked and now wanting to try this. I am 22 years of age, perfect jet black hair, I am just wanting to try this since I haven’t dyed my hair in about 4 years and I would like to see if it enhanced my natural color. I post this comment since I believe a response from you would be valuable to me. Does the use of hairprint permanently give natural color to your hair or you need to keep repeating it the way you do with hair color’s or dyes? Do you know of a natural root touch up with out the oxide and stuff your not suppose to use before Hairprint that I can use in between using Hairprint when my greys start to show? I am in my mid-fifties and had pretty silvery hair weaved with varying shades of a warm, chestnut brown before using the pre-treatment and packets+bottles 1 and 2. I did not use packet+bottle 3 because the Hairprint customer service person advised me not to if I was concerned about an odd color shift. Unfortunately, after a couple of hours of having used the product, my hair is VERY, DARK, almost black! That is from only using the pre-treatment and packet+bottles 1 and 2. I am beside myself with how tragic this is. I have been a poster child for showing how beautiful, authentic, silver hair can be. I used the product because I was intending shiny and conditioned hair, (NO COLOR) now I have charcoal black hair with a green tinge. It did cover up my silver but that was not my intention. I purchased “brown-5100” and again only used the pre-treatment and packet+bottles 1 and 2. BE MINDFUL! Prior to using Hairprint I hadn’t colored my hair in about 6 years and live a very holistic lifestyle because of chemical sensitivities. Hi Roxana, I’m so sorry you did not get the results you were expecting. Truly I am. From your description it sounds like you were using the Anti-Aging formula, which I believe is for individuals who do not have gray hair. 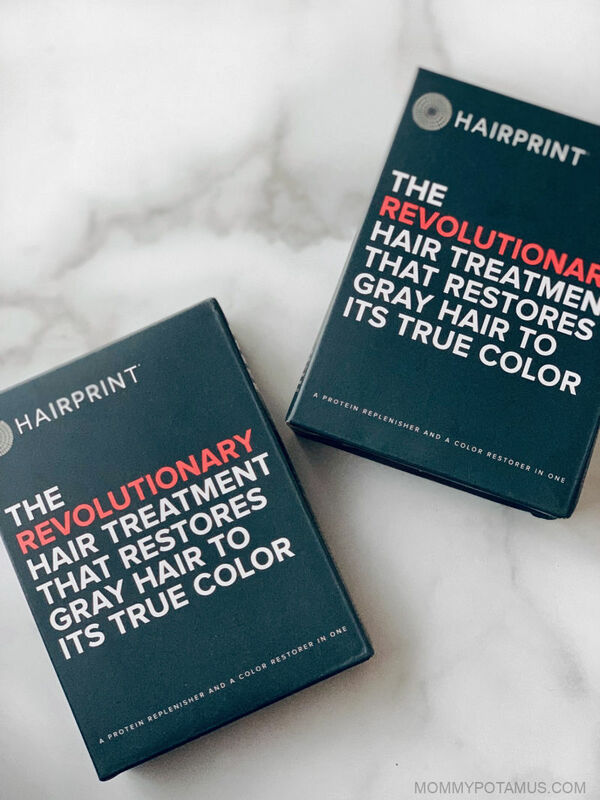 I have forwarded your comment to the Hairprint customer service team so that they can take extra steps to ensure customers are aware that the anti-aging treatment should only be used if no silver/gray is present. Again, I’m so sorry. Hi Roxana. Thanks for sharing your experience. Question: since you are chemically sensitive, I wondered if you had any odd sensations or symptoms while using Hairprint. I felt weakened and shaky, even somewhat dizzy. I withstood it the first time I used the product but did not color again for months. When I tried it the second time I was unable to complete the process beyond the first step and rinsed it off. Symptoms persisted for several more hours, albeit more mildly. The ingredients are so few and seem harmless enough but something in this product is affecting me adversely. I had high hopes for this product, but I guess the search is still on…sigh. Hi. Has anyone experienced hair loss since using hairprint? I have been using Hairprint for about 6 months and I feel like my hair is thinner. I seem to loose quite a bit of hair in the shower nowadays. YES – I was wondering why that was happening and did not connect it to the use of Hairprint. I cannot seem to locate the coupon codes in your write-up. Can you please help? Hello, I too have over 50% grey and have been dying my hair for about 20 years. I have long curly brown (with white) hair. I came across this product while researching for some sort of natural product, I felt I was really damaging my hair and had been noticing a lot of hair loss after applying/rinsing the OTC dye. My hair also grows quickly and I found I had to color my roots every week! I decided to try Hairprint, I have done it twice now. the first time I did do the double kit process as recommended. After the rinsing the first kit, I found a scary amount of of hair loss or shedding again, it didn’t completely cover the grey, but the color was great. So I decided to go ahead with the second kit because I was now in it and didn’t want to go back to regular dye! After the second kit, grey was covered and much less shedding. I used their kelp conditioner, which I CANNOT recommend. It left my hair feeling like hay. I emailed them and asked about this, I was told that my hair might be “addicted” to other products and give another try ( they refused to refund). I tried it two more times with same result – so that was a waste. I do also want to impart to anyone new to this product that it is very messy. I am a cook and do a lot of things myself, but this was beyond my expectations for a packaged product. It takes a long time -especially for two kit process. I felt it took most of my day – between prep, then all the waiting with product in the hair and all the steps… then the clean up! You must have Oxyclean on hand. It is the only thing that gets the staining off the counters, sink etc. Two weeks later my grey was popping again so I applied one kit. Once again, a lot of hair loss at the final rinse, but the color and texture of my hair is really nice. Also I’ve noticed that the line of grey at my roots seems diminished, there is not as strong a delineation with Hairprint, so I think the return of natural pigment has been successful. I will keep going and hope the hair shedding declines, I much prefer the natural products and am getting used to the messiness. I’m curious. Can you use Hairprint over hennaed hair or henna over Hairprinted hair? Thx! What shampoos and conditioners re best to use with hair print to hold the color longer? Also, how did you get the highlights in your hair without it turning green? I spent a month of research on Hairprint and read as many reviews as possible. I was very apprehensive at first because people were talking about their hair turning black. My hair is a normal short men’s hair cut. I had been coloring it with Madison Reed color. Tired of chemicals, I thought I would try it. I purchased the Brown option. The other option is Dark. All I can say is I haven’t seen it look this natural since my ’20s! Very pleased and impressed! There is but a tiny section near my side burns and side of face that could still be covered. Most of it covered really well. I love it and I’m happy. Only took me the amount of time in the directions, 45 minutes… for short hair anyway. My hair is shiny and feels great. I didn’t rinse any of the first two applications for restore, so maybe that is why people aren’t getting covered as well as they would like it to. Oh, I covered the sink with an old towel, used plenty of gloves and didn’t leave a drop anywhere. Sure, it costs a bit more and takes a little longer, but my hair doesn’t look like a fake color! The only thing I did notice was that I had an allergy symptom to the pre-shampoo treatment. My nose began to run and I was sneezing. I emailed them to ask what was in the shampoo because I’m usually only allergic to chamomile, ragweed and dust mites. where to order the product and is hairprint gives the hair a permanent color or just like any other hair color its temporary. please let me know as I really need to order this. For those who don’t want to dye or color their hair, I found that when I used products containing the NT Factor, my gray hair grew in dark again. My hair dresser was amazed. I had to stop taking these products when I learned that I have Methylation difficulties and need to avoid Folic Acid. It’s in all of them as far as I recall. It’s slow, so there’s no overnight miracle, but I got my natural color back gradually, mostly on my crown. Look up NT Factor for more information. I am a cosmetologist and a nutritionist. Chemicals whether natural or synthetic are chemicals. Any thing that stains or colors your hair has to either coat (temporary) or enter your hair shaft. So something in this product opens the hair shaft and deposits it. Each of you have your own body chemistry, any drugs or meds ie supplements you consume can be deposited in your hair. I have seen women’s hair turn mint green and for perms some hair curls and other strains were bone straight. Many times your hormones can play with your hair. People who are Multiply chemically sensitive can react to anything. I am MCS. Food and chemical sensitivities are real and can be dangerous. And yes these kinds of products can cause hair loss. Even if you don’t apply on the scalp vapors can be absorbed. Your skin is your largest body organ. Each of you are an original art work. I would only do a skin test as all hair dressers know they should do before any chemical process. Stress, life style, epigentics and where we live and what we eat, put on our skin, breathe all count. It will react on each person differently. Even pure organic Essential Oil react differently on people. After reading all of the comments, I would not try it. And as to not being able to us other hair colors that is the most scary for me! Why, because if I grow my hair out all natural and can’t use it, then it does something that changes my body chemistry? My chemistry is most likely too old, but I have kept up all of my licenses and credentials and research every day. My contacts is world labs may come in handy, will pose this question to a researcher who has never sold their name of position, chemicals all build up on us, in us and inter cellular in us. Detoxing helps, eating healthy helps, but knowing your body is the best route. When in doubt “don’t” , yes the world judges woman for their grey hair. And we gain weight and get wrinkles. Use to think that I would do plastic surgery when I needed it. No longer I have earned my face. My mom was stunning, never wore an drop of makeup and never colored her hair. Yes I do color my hair, myself. Compared to the water, the chemicals sprayed on people’s lawns, EMF’s, now 5G and smart meters, 27 chemicals used on Strawberries (non organic) my hair color is really low. My nails never see Polish as it goes directly into your blood stream in about 20/40 minutes artifacial nails are pure death, and many a woman can’t become with child because of EMF’s and nail junk. Sorry but I am an Integrative Functional Medical Nutrition Therapist and what is done to our bodies by us is horrible. Study learn, seek and heal. I have a lot of gray hairs perhaps 20% (more in sides). I have been using black henna and recently normal henna + Coffee mix which I keep for 8-9 hours then wash off. My natural hair is black colour. 1) My Question is – Do I need to follow Steps mentioned in Transition Tips tab in the hariprint site? 2) What are the different items you suggest to buy, is only Hair restorer enough? 3) How many quantities will I need? As I live, UK I want to save shipping charge and so order all quanities once. The henna I have been using says natural henna (of course black henna are not purely natural) but I stopped using black henna 1 month before and now using purely natural Henna + cofee mix. While I was using black henna, I had to use fo revery 3 weeks or 4 weeks and it didn’t last long. 1. I would check with Hairprint on this – they will know better than I do. 2. I’ve only tried their hair restorer, so that’s the only product I currently can recommend from experience. 3. I think how many boxes are needed depend on hair texture and percentage of gray hair. I would check with them and see what they recommend. Your information is so good. please let me know a detail. I see this post is a couple of years old. Do you still use this product? Thank you for the fast response!!! I love your website. I have made many of your body and hair care recipes and really LOVE them. I have been using your coconut oil shampoo bar for a couple weeks and the vinegar/water rinse a bit longer. Hairprint says you NEED to use their shampoo prior to the color treatment. It is very expensive. Did you use their shampoo or do you have a suggestion on a shampoo/conditioner to use prior to the color treatment? It has been 6 weeks since my last color. I don’t use their shampoo but I do leave the “prepare” shampoo included with Hairprint on the grays near my face for about 20-25 minutes instead of 5 (I rinse it out of the rest of my hair). I did that at their recommendation because I still had some grays after an application and asked for help troubleshooting. I just put the back of my head under the shower nozzle. Thanks for your reply. I also left a really long comment on here and I don’t see it. It detailed my Hairprint experience.. Did it get lost or did you decide not to publish it? Listen, I don’t mean to be unkind, but you are not portraying this product accurately. It does not “activate” your body’s production of melanin. That’s rubbish, and even if it were possible, it would almost certainly be unhealthy. This product contains hydrogen peroxide — IT’S A DYE. If you don’t have a lot of experience with hair dye, let me tell you, that is the key ingredient in haircoloring. My advice to you is to take this off your website before somebody comes after you for false advertising. Agreed. I believe this is just hair dye. Hydrogen peroxide is a bleach used in hair dye and most likely one of the other ingredients provides the darkening – hence why it only works with brown hair. The company seems to be making false claims. Please research this further and update the post. I know this thread is a bit old , I love the idea of hairprint but about a week or 2 after using it I have been experiencing serious hair loss. I have been pregnant 4 times and it is similar to the amount loss about 3 months after delivery. Has anyone else experience this ?? I’m not positive it was the hairprint but nothing else in my life has recently changed …. Hi Sami, I’m sorry to hear this. Maybe someone else can respond with more insight but I wanted to share one quick thought. Every single ingredient in the pretreatment scores a 1 (the best rating possible) with the Environmental Working Group, and nearly all the Hairprint ingredients do as well. The only exceptions are ferrous gluconate, which is not listed in the Skin Deep database. 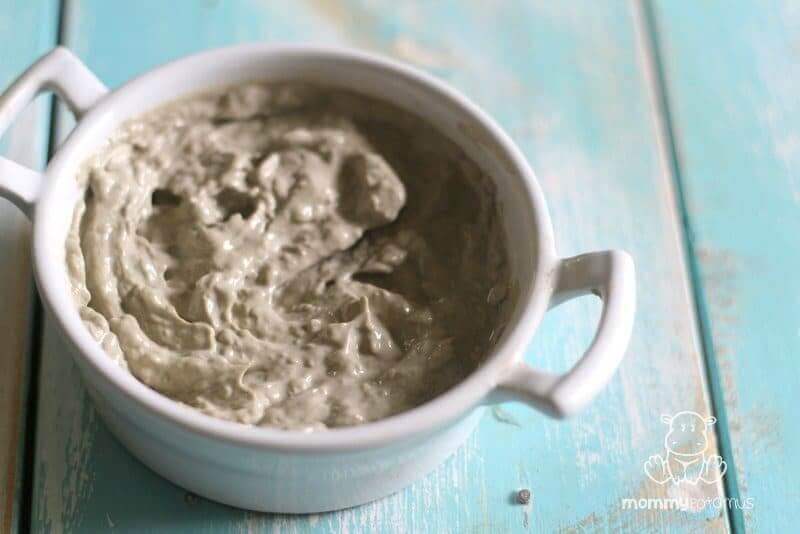 However, it is a form of iron that is considered optimal for those that need to supplement – it’s the form found in Floradix, which is what my midwife recommended to me when I was pregnant with my first. Diatomaceous earth, which I’ve written about before, gets a 1-2 and manganese gluconate (a mineral) gets a 2. In my opinion these are very safe ratings. Many of the essential oils I use therapeutically have ratings that are less optimal due to the potential for irritation at higher concentrations. I’ve been using Hairprint for a couple of years now with only positive results (restoration of color and thicker, stronger hair). That said, I wonder if perhaps it’s possible that some people could experience hair loss after using a new product containing an ingredient they might unknowingly be allergic to. Do you think that might be a possibility? I also had this issue, I can’t be 100% sure of course that it was Hairprint but nothing else in my diet or routine has changed and after using Hairprint for about six months a huge amount of my naturally curly hair started to break off (and it continues to break off). I have literally lost over half my long hair, which all used to be one length. When I asked Hairprint if anyone else had complained of significant hair breakage, they admitted that others with long hair have reported this problem. They said it’s to do with the ‘prepare’ sachet because it is so highly alkaline and can make sensitive hair very brittle. They told me to only put it on the roots not on the length of my hair..after I had read on their site and on the box instructions to leave it on for longer if your grey hairs are stubborn. It also says on the site to use a paste of baking soda and water on your grey roots to get better coverage, which is also highly alkaline and probably not a great idea. I was leaving the prepare sachet on for 20 minutes or more. It would have been great to have more warning of this! I do think it’s a dye and it’s horribly messy, but it works quite well for me (grey at temples only) and I was pleased to find an alternative to conventional dyes. It only lasts about 3-4 weeks maximum and it is definitely way darker than my natural hair colour but after a wash or two it looks good. Even though it has pretty much ruined my hair, in the absence of any other natural hair dye I am continuing to use up the boxes I have, I just don’t use the prepare sachet at all and it works OK. When I run out of boxes however I will probably go back to a normal hair dye. I had been going through the process of getting my hair from red (I had been dying it for about 15 years) to as light of a blonde as possible and it was absolutely killing my hair. It was fried, crispy, dry and simply unhealthy looking. After using the Made from Earth Avocado Hair Mask just once, my hair felt totally different! It was soft, smooth and smelled great. I only use a small scoop, the same as I would my typical conditioner, and leave it in for the recommended 5-7 minutes while I shave and soap up. The results are awesome. This definitely saved my hair! I just wanted to add on here that while I’ve given up on going blonde, I’m still using this product and it’s absolutely amazing. I used to suffer from really bad split ends all the time but I have been able to go over three months now without a trim and there are no split ends in sight! I used Hairprint a couple times, and it didn’t work for me. I followed directions and used various tips I read online including baking soda, etc. I contacted their customer support, provided photos, and appreciated their honesty when they said it won’t work on my “resistant white hairs” which “have a thick cuticle and the hair is hard to open without chemical developers.” I have less than 5% gray/white but it’s mostly at the front and temples, and I have dark hair so it’s obvious and bothers me. Any suggestions for less toxic products (besides henna) that will work on these pesky white hairs? Thanks.